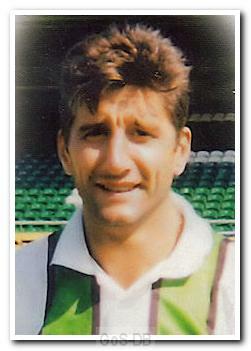 Clayton arrived at Home Park from Huddersfield Town in the summer of 1995 as part of the deal that took Paul Dalton in the opposite direction. A tough-tackling midfielder with a ceaseless engine and a big heart, Clayton was a perfect fit for new boss Neil Warnock's uncompromising new dawn. The former Cambridge United man was an integral part of the Argyle side that went on to go up through the playoffs in 1995/96, though fans may best remember him for scoring a long-range screamer at Exeter City in early Spring. A serious injury restricted him to just a solitary substitute appearance as Argyle consolidated in the third tier the following season, and he eventually joined Torquay United on a free transfer - going on to make 69 appearances for The Gulls before settling back in his native Yorkshire.